Swagtron T1 reviewed - Is it the really best Swagtron yet? The Swagtron T1 has a 8+ mph top speed, a distance of 12 miles which is a bit lower than the competitors but it makes up for it with a 1 hour charge time which leaves you with less downtime. It's sentry shield features and fire proof outer covers makes it a superior hoverboard when it comes to safety. A good hoverboard for all ages. Distance: 12+ miles on a single charge. Features SentryShield which provides multiple layers of battery protection and increasing safety. 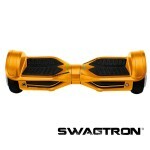 The Swagtron T1 has aluminum wheels and a durable ABS body. Can climb surfaces up to an angle of 30°. The hoverboard is self-balancing and features motor and gear stabilization features for a comfortable ride. Can accommodate riders from 44lbs to 220lbs. Non-slip footpads give added rider stability and safety. Stylish, fun, and available in a mix of bold colors. The fireproof plastics is easily cracked, we recommend a bumper guard. They’re not just for viral videos, hoverboards are exciting and lots of fun for anyone interested in a new way to get around. The T1 is the best Swagtron yet, a self-balancing scooter with all of the essential features you need to have a safe and fun ride – a sleek design, bold colors, LED lighting, and plenty of features that will make sure you can focus on having fun with it whether you’re a beginner or a pro. What a step in the right direction for Swagtron, formerly known as Swagway. The new Swagtron T1 model is compact, easy to ride, lightweight and fun for all ages and it makes an excellent choice for parents looking to buy a hoverboard for child. A T1 can cruise at over 8mph, covering over 12 miles on a fully charged battery before needing an additional charge. Charging itself is easy and safe with the included battery pack, taking only an hour to reach its full capacity with the built-in high LG lithium battery. When driving you’ll be able to achieve the most speed on even, smooth surfaces, but the Swagtron can climb inclines of up to 30°. It even have a learning mode that helps you pick up the basics before you take the hoverboard on at its top speeds. Most riders can pick up the basics in under a half-hour. 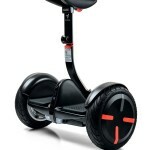 Its self-balancing technology makes it very easy to rest comfortably on while riding and you won’t have to feel tens. And with a modified design, this is a hoverboard that will let you ride in style. They might not have changed much of its appearance but it has gotten a much smoother look. And an attention to safety from the fireproof outer design to the new UL certified battery with sentry shield, means the T1 is a great choice for anyone interested in owning a hoverboard from a brand that has eliminated the concerns of fire and battery malfunction. Don’t miss out on the T1, it’s a far more superior board than the Swagtron T3 even though one feels it should’ve been the other way around. There has been plenty of press about the safety of hoverboard technology with concerns about injuries and spontaneous battery fires. The new T1 addresses these issues, and is one of the safest hoverboards on the market. As a company Swagtron places a major emphasis on safety and the T1 has been carefully designed and rigorously tested with an eye to keeping riders comfortable and safe both on and off the board. The hoverboard is built with features like non-slip footpads to give you grip, a learning mode to help new riders, and a new battery design that focuses on safety and reliability. The T1 is the only Swagtron model to incorporate the multilayered battery protection of SentryShield, and the T1 has been reviewed and is fully UL certified. Only a handful of hoverboards have successfully gone through the rigorous testing required for UL certification that the T1 has. These features, and the UL certification should put you at ease, so you can focus on the fun aspects of riding a hoverboard. The Swagtron T1 is by far the best Swagtron hoverboard we’ve reviewed so far. It’s a great design from a company that’s been in this business from the beginning. The T1 is a stylish, easy-to-use, safe, and most importantly fun hoverboard. Just like the Iroam was when it was still available for purchase. Whether this is your first time testing one out or a step up from an earlier model, the Swagtron T1 has plenty to offer and you’re going to enjoy hopping on and giving this cool new tech toy its first spin. It has a great combination of fun and safety. Hope you enjoyed our Swagtron T1 review, there isn’t much more to think about. The fact that it is one of the cheaper hoverboards available is a big plus in our books. Just get one, will you! Swagtron T3 hoverboard Review - First UL approved hoverboard?